The Bucket Shop can be found within the walls of the World renowned Roundhouse Bar. Take home some Roundhouse swag to commemorate your visit with a variety of great choices. The selection is eclectic. Items include t-shirts, hoodies, blankets, ear rings and much more. This shop is located in the rear of the building near the back entrance. Selections are added often, so check often to see the latest styles and items. Since 1873, many revelers have passed through and enjoyed a libation at Put-In-Bay’s oldest watering hole. Originally called the Columbia Restaurant, offerings included beer, wine, food and ice cream. Still, the origins of the Roundhouse Bar name remain unknown. However, two theories exist. One of the first owners, George F. Schmidt, had the nickname of Round House Smith. However, others point to the very shape of the building that sparked the name. Today, the Roundhouse Bar is owned by the McCann family who purchased it in the 1950s. They painted the exterior the iconic red it is today. Quality live entertainment is one of the most recognizable features of this establishment. Mike “Mad Dog” Adams is one of the most prolific entertainers to ever grace the stage. His one man music and comedy routine has been enjoyed here for over 35 years. This is a Put-In-Bay island experience that should be a must do on a trip to the island. 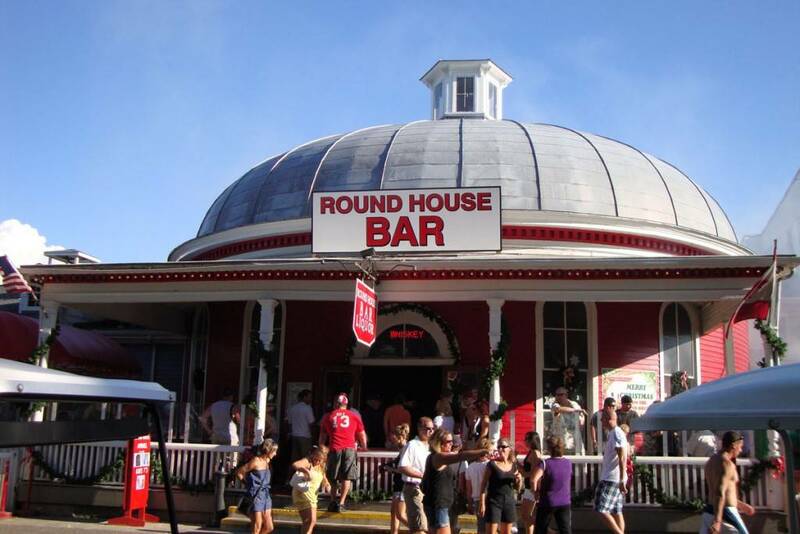 So, for the best in live entertainment and historic ambiance, the Roundhouse Bar is the place. The Bucket Shop is the place to stop to find unique offerings. Therefore, to remember the great times had at Put-In-Bay’s Roundhouse Bar, pick up a shirt or hat. This will certainly be a conversation starter, as many people have made the pilgrimage. There are many other shopping opportunities on Put-In-Bay. Be sure to include the Bucket Shop on the agenda for fun, unique Roundhouse items.